For this report we got an email from a client. We figured it was long enough to just use as a quick middle Oct report. At the time of writing this, the fishing has gone nuts, and that will come out on the next report. 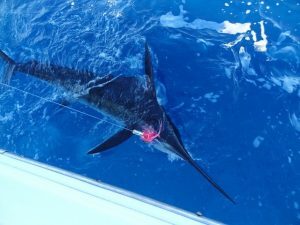 There are now Wahoo, Dorado, Marlin and even Sailfish everywhere outside the mouth with all the amazing action south of San Carlos. But that will come out in the next report we post. Below just a quick blurb on a recent trip from a clients perspective. “Thanks for all your help in arranging our recent trip. Although the weather didn’t cooperate for three days of the trip (hurricane Sergio remnants), we did manage to get out to the ridge (actually we just went outside no to the ridge) on our final day which was our goal for the other days as well. 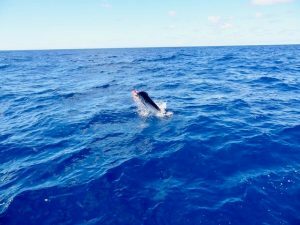 The tuna and wahoo were missing on our day to the ridge but we soon found out why…. The striped marlin were everywhere. We had multiple marlin chasing the lures at any given moment, often had multiple hook-ups, and could see them swimming by the boat as we fought fish. We had one marlin chase a tuna feather all the way up to the motor before taking it, and caught another one despite the fact that we accidentally left a hook tip protector on the hook. All total we probably saw 50-stripers, hooked up with maybe 17 or 18, and landed 7 (releasing 5 and keeping 2 smaller ones). 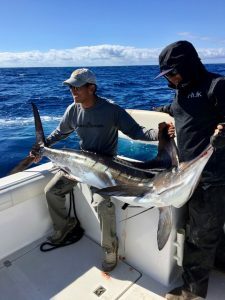 Most of our party of five had never caught a marlin and at the end of a 6-hour stretch, all had caught one and some had caught 2, with plenty of fighting action in the interim. Attached our a few photos of our day on the Ridge.